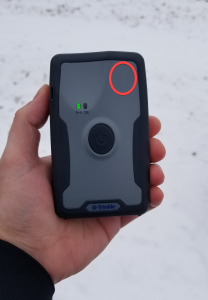 When using just the R1 antenna and collecting GNSS locations and features, always be aware of where the location of the antenna is located. The antenna is located at the upper right of the power button. 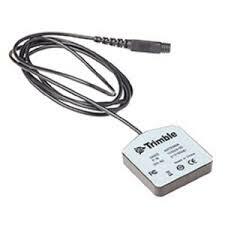 Tips to proper data collection with the Trimble R1. Take it out of your jacket pocket. Do not set it down on the ground or on your feature. Hold it vertically over your feature. Face the antenna in the direction of where the most GNSS Satellites are located – keep your back to the North when in the Northern Hemisphere. If it is clipped to a Safety vest of Jacket see number “4”. If the feature is a vertical object such as a sign, light/power pole then be sure the R1 is on the South side of that feature in the Northern Hemisphere. 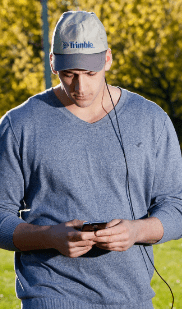 If you prefer, there is an option to use an external puck antenna with the R1 to wear in or on a hat or on a pole. Very valuable post. I always assumed that the antenna was across the top of the unit and would commonly set it vertically on the item being measured.